The offices and studios of WRMC, the College’s radio station, are on the top floor of Proctor Hall. The station is tucked away on the west side of the building, and it is not all that easy to find. A relatively sterile stairway leads one up to and back down a brightly lit hallway, past the Redfield Proctor Dining Room and to a lone door decorated in record label stickers. Inside, the space appears exactly as you would image a student-run operation to look: a lounge area with a couple of couches that are probably older than the students themselves; a side table holding a dusty Keurig coffeemaker and a stack of CDs waiting to be reviewed; a couple of doorways open to an office and server room; and then a dark, narrow hallway that leads to a recording space and the on-air studio. WRMC has been broadcasting since 1949, ever since John Bowker ’52 and James Kitchell ’51 jerry-rigged some equipment in a small chicken coop behind Bowker’s father’s house in town and began speaking to, well, a small portion of Addison County. During the first couple of decades the station broadcast for about 6–12 hours a day; most days the weak signal barely reached the dorms on campus. Since the addition of a transmitter (10 watts!) in 1967, subsequent upgrades in the ’80s (100 watts!) and into the 21st century (2,900 watts! 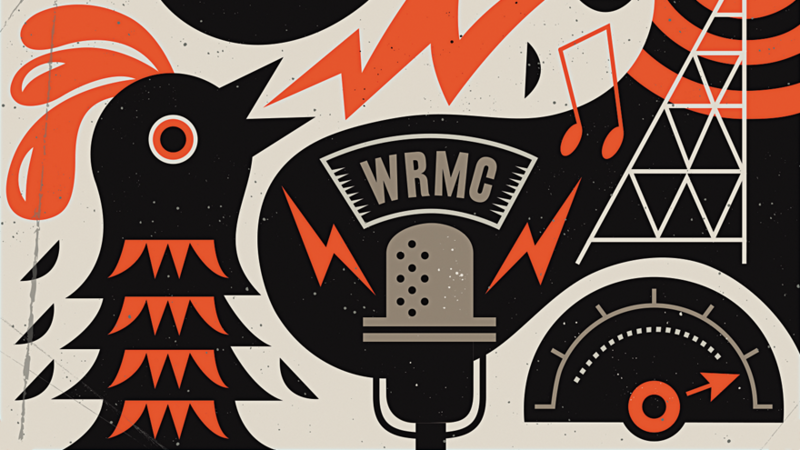 ), WRMC’s terrestrial reach has steadily expanded and now includes live streaming of all its programming. For the past 10 years or so, the students in charge have humored a couple of old guys—me and my friend Tim—and have provided us with a Friday afternoon slot (3:30–5:00) during which we play, as our tagline pretentiously states, “the finest in eclectic college radio sound.” We’re one of 125 shows on the air each week, round-the-clock programming that features music and talk, news and radio theater, jazz and soul, hip-hop and punk. The other day, as I came into the studio with a tentative playlist that included Robyn Hitchcock, the Drive-By Truckers, and the Wu-Tang Clan, the outgoing DJs were wrapping up their set with—James Taylor. I couldn’t tell whether the selection was ironic or earnest; whatever the case, WRMC is thriving and now traveling around the world and back again. Not bad for an effort that began with a couple of guys and a small backyard chicken coop.